Address: Nicaragua, 3, Puerto del Carmen (Lanzarote), Islas Canarias. Located just 40 metres from the beach in Puerto del Carmen, Elena Apartments features an outdoor swimming pool surrounded by a sun terrace. Free Wi-Fi is available in public areas. All apartments include a kitchen with a fridge and an oven. They also feature a balcony, satellite TV and a private bathroom. Accommodation is cleaned 5 times a week. Towels are changed twice and linen is changed once a week. 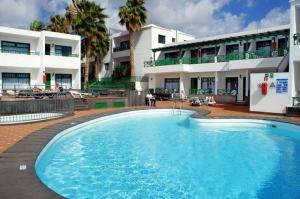 At Elena Apartments Lanzarote, free sun loungers are available by the pool. There is also a poolside snack bar serving light refreshments. Apartamentos Elena Puerto del Carmen sit in front of Avenida de las Playas, where you’ll find many restaurants, bars and shops. Lanzarote’s capital, Arrecife, is a 15-minute drive from the accommodation and Lanzarote International Airport is 10 km away. Please inform Apartamentos Elena in advance of your expected arrival time. You can use the Special Requests box when booking, or contact the property directly with the contact details provided in your confirmation. Arrival Information: Reception is open 09:00 to 13:00 and 17:00 to 20:00. If you are due to arrive outside of these times please inform the apartments prior to your arrival.